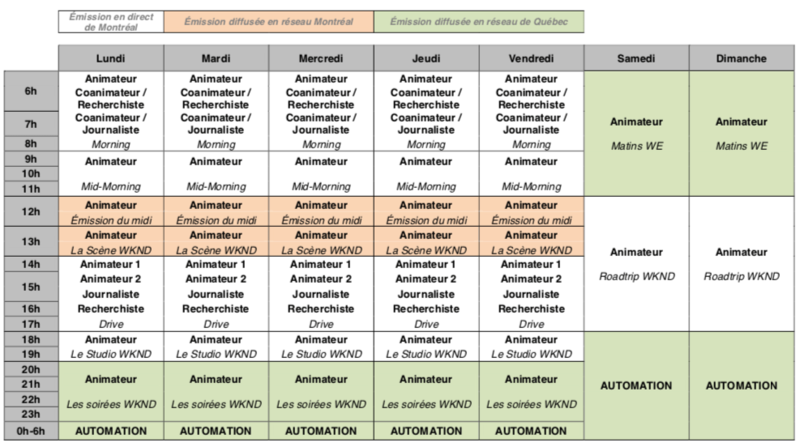 Leclerc’s proposal would see the Montreal station have 82 hours a week of local programming, and the Montreal and Quebec City WKND stations share programming at lunchtime, on weekend mornings and during the evenings and overnight. Most of the network programming would come out of Quebec City. The purchase price is $19 million for the two stations (or as low as $18 million if expected profit margins aren’t met this year), with $16 million payable at closing and another $3 million in payments on the 4th, 5th, 6th and 7th anniversary of closing ($600,000 each for the first three, and $1.2 million for the last). The deal is contingent on the CRTC approving the change in format and the exception to the ownership policy. Without either of those related requests being approved, Leclerc would rather the CRTC not consider the acquisition. In the meantime, 91,9 Sports maintains its current format and staff. Normally a change in format for a radio station doesn’t require CRTC approval. But an exception to this is when a station wants to switch to or from a specialty format, and a station with more than 50% spoken word is considered a specialty format. RNC Media switched CKLX-FM to that format after a decade of failures trying to make a jazz station work in this city. It first tried to copy Radio X in Montreal, then tried a more serious news-talk format in the short-lived “Radio 9”, then finally in 2015 adopted a sports-talk format, the first francophone full-time sports station since the change of vocation of CKAC in 2011. Though it’s not explicitly stated in the notice, the location of the hearing in Quebec City likely means Leclerc will be asked to appear in front of a panel of commissioners to present its case and answer questions orally, and intervenors who wish to support or oppose the application will also be invited to speak. The notice of hearing also mentions proposals for new radio stations in the Quebec City region, including a proposed anglophone station. The question of whether to allow new stations in these markets is being attached to this hearing, but no new documentation is being put on the public record yet. It’s unclear if the commission plans to consider the question of whether to proceed with the applications at the hearing, or consider the applications themselves there. Further documents are expected to be added to the public record. Leclerc’s brief with the CRTC, which is 71 pages long and 30,000 words, goes on what I can only describe as a long rant about the radio industry, touching on the “titans” of Bell and Cogeco versus the small players and independents, the high cost of talent compensation, Montreal-centric news coverage, and the high French-language music content quotas for radio stations. Justifying the Montreal request specifically, Leclerc points to expenses to hire on-air personalities like Jean-Charles Lajoie, Mike Bossy, Mathias Brunet, Bob Hartley, Pierre Houde, Georges Laraque, Yvon Pedneault and Réjean Tremblay, which it notes are “prohibitive” despite the increased ratings they generate. Leclerc also says 91,9 Sports was a victim of Quebecor’s demands that its personalities drop collaborations with radio stations as it prepared to launch QUB Radio. That forced several TVA Sports contributors to abandon their regular gigs there. CKLX-FM, it says, has never been profitable, and has instead faced “significant losses year after year” with little hope to turn that around. Leclerc acknowledges the change in vocation “risks not pleasing sports fans” but says sports talk is not its specialty. Asked specifically by the CRTC about job cuts, Leclerc’s answer is not on the public record, but it does project cutting expenses at the station by $2 million over the first two years, before bringing some of that budget back by Year 5. That would mean a significant cut in staff. Leclerc tells La Presse that the cuts are actually minimal, as little as two employees, but that doesn’t take into account the many columnists and regular contributors who would no longer be necessary. Engager de grandes vedettes et des humoristes pour livrer des interventions écrites d’avance, qui se terminent invariablement sur un gag, semble une formule bien établie, mais peut-être est-il temps, pour les radios musicales de Montréal, de miser sur l’authenticité, la spontanéité et la proximité avec l’auditeur, plutôt que sur la notoriété d’un seul individu. It also notes that it plans to move the station out of its current studio, because of the high cost of its rent. It’s unfortunate that this happens particularly because of the station’s long history of struggling to find a format that works. It’s only 14 years old but between Couleur Jazz and Planète Jazz and Radio X and Radio 9 and 91,9 Sports it has had trouble holding onto a brand. With the modest but significant increase in ratings after the switch to sports, it looked like they’d finally found something that worked, but talk is more expensive than music, and the increased audience simply couldn’t justify the increased expense. Whether Leclerc will be successful in this application is a tough question to answer. CKLX-FM was given its first licence because it promised a specialty format of jazz music. The CRTC denied previous attempts to drop the jazz requirement in its licence, but finally accepted to switch to talk, another specialty format. With this change, it becomes a generic commercial music station, a backdoor entry into a market that is otherwise impossible to get into because of a lack of available FM frequencies. In justifying the request for an exception to the rules to allow a third station in Quebec City, Leclerc doesn’t offer much more than the need to compete with Bell and Cogeco. There are no promises of major additional news coverage, like what Cogeco promised in order to keep three francophone FM stations in Montreal, or keeping an unprofitable specialty format, like Bell promised to keep TSN 690 in Montreal after the Astral Media acquisition. And Leclerc doesn’t promise any additional tangible benefits beyond the standard 6% of the purchase price. Leclerc did promise that CHOI would have at least four hours of news programming a week, including 20 minutes on weekends. With the acquisition, Leclerc would be getting its hands on Quebec City’s most popular commercial radio station, and the three stations combined would have a market share of 28.5%, versus 19.2% for Cogeco and 16.1% for Bell. As this process works its way through, staff at the station have to continue as if nothing is happening, knowing full well if their potential buyer’s plans are accepted they’ll be out of a job. It’s a very similar situation to what happened at TSN Radio in 2012, when Bell proposed to turn it into RDS Radio in order to get around ownership limits during the first attempt at acquiring Astral Media. More than 700 people wrote to the CRTC to oppose the application, giving the issue an outsized importance in a hearing about the acquisition of dozens of radio stations and TV channels. CRTC chair Jean-Pierre Blais said (probably half-jokingly) that having to read all those comments ruined his summer vacation. Like with the current application, in the end it might become moot if the larger deal falls for an unrelated reason. The first Bell/Astral deal was denied for larger competition reasons, saving TSN 690. For its second attempt, though, Bell requested an exemption to the rules to allow it to keep TSN 690, which was granted. Fans of sports talk who want to keep 91,9 Sports in its current vocation are probably best served by reinforcing the big hill Leclerc has to climb to convince the CRTC that it should have three stations in Quebec City. Killing that exception would cause the entire deal to fall apart. Which would save 91,9 Sports in the short term, but won’t magically make it profitable. To really make it work would require something more fundamental. Contributors and fans of 91,9 Sports are reacting with disappointment at the news of its de facto closing, seven years after francophone sports fans lost CKAC Sports and almost lost TSN 690. A Facebook page opposing the plan has already started. Je lis beaucoup de choses au sujet du @919sports depuis ce matin et j’ai pris du temps pour trouver les mots. Nous sommes loin d’être morts et enterrés. Nous continuerons de vous livrer le meilleur du sport à Montréal, comme nous l’avons toujours fait. Merci pour les bons mots ?? Je me joins à tous ceux qui ont exprimé leur déception de voir la fin possible du @919sports. C'est un plaisir pour moi de partager le micro avec des travailleurs acharnés, dévoués et compétents. Montréal mérite une station 100% sportive. Je suis très déçu d'entendre que ca sent la fin pour @919sports La concurrence dans la radio sportive nous a rendus tous meilleurs. À tous les gens talentueux là-bas, gardez la tête haute. Lorsqu'une porte se ferme, une autre s'ouvre. Bonne chance à vous tous. Très triste pour les collègues et les auditeurs du @919sports. À mon avis, le sport est aussi important que l'art dans la société et cette station prenait de plus en plus de place dans le quotidien des gens. La faiblesse du signal aura peut-être été un frein à la croissance. Vraiment dommage ce qui risque fort d'arriver au @919sports. Une belle gang avec qui j'ai eu l'occasion de travailler cet été. Des gens motivés, talentueux, débrouillard. etc. Bonne chance à tous pour la suite des choses. 91,9 Sports star Jean-Charles Lajoie addressed the news on his afternoon radio show on Friday, noting that nothing is final yet. But he spent a lot of time ranting about the website Dans les coulisses, which broke this story last night, describing it as being run by a “failed rapper” and denouncing it for irresponsible reporting. While there can often be lots to criticize in websites that traffic in sports rumours, nothing in DLC’s reporting turned out to be incorrect. But I’m sure they’ll be very saddened to learn that Lajoie is unsubscribing from the website. 1. J'ai toujours été (très) fier de ce que j'ai accompli dans la musique. 2. Je suis très fier de ce qu'on accomplit en gang sur DLC. Vraiment. 3. J'ai de la réelle peine pour plusieurs personnes au 91.9 Sports. 4. Je n'entrerai jamais dans des insultes comme certains le font. Meanwhile, Lajoie says the station’s manager will find the “rat” who leaked the news to DLC. The CRTC is accepting comments on the Leclerc acquisition, the exception to the ownership rules in Quebec City and the change in format of 91,9 Sports until Dec. 17. They can be filed here. Note that all comments and contact info go on the public record. I fail to see how an all sports all day radio station can make it financially in a market like Montreal. At one point one needs to realize that this city is a one sport city. All the other ones are minor, a nice event or irrelevant. At the same time though i really am sick ant tired of that CRTC country club . When you ask for a license you have to make a promesse de diffusion. How can one license go from jazz to all sports talk radio to pop music format without breaking any promises ? I suppose that 92.5 ,94,3,95,9 ,96,9 105,7 and 107,3 are not enough options to fill the need ? Financial reality strikes every time. Unless you have a strong backup organization like TSN to pick up the losses ,the french sports radio had no chance to grow to be profitable. How can one license go from jazz to all sports talk radio to pop music format without breaking any promises ? It can’t, which is why it needs the CRTC’s approval to do so. Was there ever a time when the change of license was refused ? You probably are going to find me an example i am sure. But let’s say out of 10 ,how many radio owners can do whatever they want make whatever changes they want to the initial promise they made? Trash radio might be a good start to look at for instance. There are no rules, no real regulations that you must follow. How about the french content musically wise ? How about the anything goes business of podcasts and online broadcasting ? That is a totally different ball game i agree… but one that clearly shows how out of sync the CRTC is. Was there ever a time when the change of license was refused ? Yes. In 2013, the CRTC denied an application by RNC Media to change the licence of this station from jazz to spoken word. That denial was because the station failed to respect its existing conditions of licence. The request was later granted when the station’s licence was renewed. But let’s say out of 10 ,how many radio owners can do whatever they want make whatever changes they want to the initial promise they made? Very few. It’s hard to put a number on it, because most radio station owners know what kind of licence amendment changes get approved and which kind get denied and won’t bother trying if they have no chance. The CRTC will generally deny such requests for changes during a first licence term, or if the station has not respected the condition of licence it wants to change. Otherwise, it will evaluate the request based on economic need or overall benefit to the broadcasting system. Trash radio might be a good start to look at for instance. There are no rules, no real regulations that you must follow. CHOI and other talk radio stations must follow the standard conditions of licence for commercial radio stations, which include being a member of the Canadian Broadcast Standards Council, which reviews complaints about content. CHOI already had its licence pulled under a previous owner over the content of its broadcasts. How about the anything goes business of podcasts and online broadcasting ? The CRTC does not monitor or enforce rules on online broadcasting, which is exempt from licensing. Outside of a very limited scope, radio stations should not be format or content limited in any manner. I can understand very specific cases (such as community stations or the new Native people’s network), otherwise it really should be way more open. On the other side, ownership is a real issue. Media ownership concentration (especially in the province) is a huge problem, one that isn’t easy to fix anymore. Wanting to change a station in Montreal from blabbing about sports to playing music enjoyed mostly be a certain demographic of women isn’t a huge issue. It’s time for the CRTC to get out of the business of regulating content, and instead get into the business of diversifying ownership. The CRTC should have no business approving or disapproving radio station formats. The only two categories they should have is Community / non-profit, and Commercial stations. They should leave stations change their format as they feel their market changes. Stations are in the business to make money. And if they don’t keep up with the changes of their market, then they’ll loose their listeners to the internet, or satellite services, or anything else new that pops up. A previous poster mentions how the CRTC should focus on media ownership which is a greater urgent issue than bothering stations, and listeners with their idiotic issues of formats, and percentage of spoken word or any other matter that effects programming on station. None of their business. Some people may laugh at the use of the term “The Swamp” (The Bureaucracy), but when you look at the mess of the CRTC, how can one not associate it with the term “The Swamp”.